1. CD-100-1000 100 - 1000 MHz. Entire Band 2 to 0dBi. 2. AWD-100-3000 100 - 3000 MHz. Entire Band 2.5 dBi. 3. AC-134-500 134-500 MHz. Entire Band 2 dBi. 4. CD-135-470 135 - 470 MHz Enire Band 2 dBi. 5. CD-300-3000 300 - 3000 MHz. Entire Band 2 to 0dBi. 6. LP-400-3000 400 - 3000 MHz Entire Band 9 dBi. 7. CD-470-860 470-860 MHz Entire Band 3 dBi. 8. CD-500-6000 500 - 6000 MHz Entire Band 2 to 0dBi. 9. LP-700-2500 700 - 2500 MHz. Entire Band 9 dBi. 10. MD-700-2500 700-2500 MHz. Entire Band 2.5 dBi. Multi band coaxial dipole antenna is rugged all weather model, enclosed in a ABS radome, uses high class aluminum alloy and does not require any field tuning or adjustments. The UV resistant ABS enclosure has excellent transparency for RF signals and enough strength to withstand specified wind loads. All mouti band antennas are also suitable for mounting on the vehicle using standard NATO 4 hole pattern or customezed mounting kit can also be supplied. The compact size of omni-directional coaxial dipole antenna allows easy handling, shipping and highly suitable for receiving, transmitting, scanning, monitoring and jamming applications without having the requirement of multiple antennas. The AWD series wide band discone antennas are supplied in dismentle condition for easy of shipping and handling, where as LP series multi band log periodic antennas and MD series multi band discone antennas are supplied complete in assembled condition. The stainless steel mounting hardware is supplied with the antenna. Antenna termination and feed cable lie enclosed inside the mounting pipe for complete weather protection. Our CD5 and CD6 series multi band antennas are high performance and high gain omnidirectional antennas. 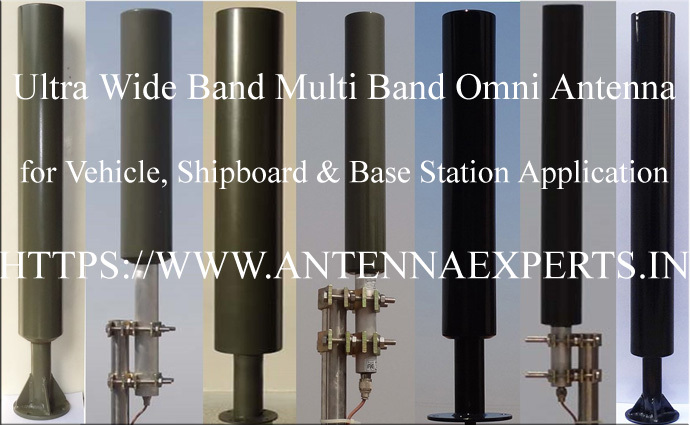 CD5-225-400 muti band coaxial dipole antenna is a 5dBi gain omni antenna covering the entire military aviation band 225-400MHz, minimizing the requirement of multiple antennas which utilized the tower space. Similarly CD6-470-860 multi band antenna is a 6dBi gain omni antenna covering the entire TV Band IV-V with single antenna. CD6-470-860 high gain antenna can be used for TV broadcasting, TV reception, low power Tx. station for small campus and remote area reception where other conventional antennas are not suitable. High power muti band antennas can also be supplied on request. Both CD5-225-400 and CD6-470-860 high gain multi band antennas uses special “Choke and Spark Gap” technique for smooth VSWR and constant 5dBi. gain over the entire 470-860 MHz. frequency band and 6dBi gain over the entire 470-860 MHz. frequency band respectively, availabel in coaxial dipole antenna section.